If you are new to keeping a marine fish tank or are looking for something new and advanced for your marine system, you may want to know more about getting a sump is. In simple terms, a sump is a supplementary tank that is placed lower than your main marine fish tank and collects drainage and houses your equipment (i.e. protein skimmer, calcium reactor, heater, etc.). 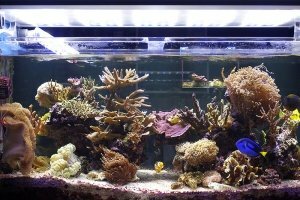 You will find that with the ever-advancing technology of marine reef fishkeeping, you start to collect more and more gadgets that can turn your beautiful tank into an unsightly mess. This is where a sump can help you tremendously. Marine sump tanks are great for relocating equipment so it is out of sight to viewers. Let’s take a greater look into the main advantage of having a sump: fish tank water control. First, having a sump increases the total water volume in your saltwater system, which in turn, means greater water stability. The temperature of the water does not fluctuate as easily in larger bodies of water and water chemistry changes much more slowly, so you will be less likely to have steep changes in parameters like salinity and pH. If you have any open systems in your aquarium there are a few different ways that water can leak out. For example, protein skimmers and trickle filters are open systems; they are designed with openings to allow water, waste and air to escape. Due to this design, there needs to be something in place to catch the overflow water that passes through – this is where a sump tank is perfect. Sumps are most commonly used by people with aquarium trickle filters; this is due to the way trickle filters are generally set up. These filters allow water to flow through the tower of the filter and flow down into a sump. Water is then pumped back into the tank and the process is repeated. A sump tank allows for greater surface skimming of your marine tank. 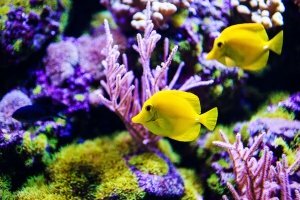 Proteins that build up on the surface of your fish tank will look oily in appearance and can collect and cause problems with light efficiency (which is vital for coral health) and oxygen / nitrogen exchange between air and water. By way of an aquarium overflow box, the surface of the water is constantly skimmed by adding water from a sump to the tank and the water then overflows into a box which then goes to the rest of the filters. This means that the surface of the water is brought into the overflow box and filtered. Water is also returned from the sump to the main fish tank. This is done by means of a sump return pump. In a complete marine tank and sump system, water is pumped from the sump into the aquarium and then allowed to flow back into the sump to be filtered and returned again. This way, the water level in your fish tank is kept constant. Always keep an eye on your sump tank water levels though, in some cases, water can drop low and expose the pump which can overheat. Fishkeepers with a sump connected to their fish tank often move their aquarium heater into the sump tank right away. This can be a good idea if there are aggressive fish in the tank that could potentially damage the heater. Keep in mind, if you place your aquarium heater in the sump, the main fish tank is being heated indirectly. While this is a safe way to heat a marine fish tank, it is important that you consistently check the temperature of the water in the sump. As mentioned earlier, sumps have an aesthetic benefit as well as a practical one. There is a lot of equipment that goes along with having a marine fish tank and much of it can be quite large and not very nice to look at. A sump tank takes all the bulky equipment and hides it away so that the main focus stays on the beautiful marine life in your tank. Having a sump also allows for you to set up a refugium right under your tank. 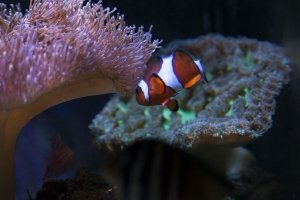 Refugiums are really beneficial to marine fishkeepers and have a couple of different purposes. The main reason you will find that people have a refugium as a part of their sump setup is to act as a ‘living filter’. In other words, it is a space to harvest algae that will further filter waste in the water passing through to be pumped back into the main fish tank. Ammonia, nitrate, phosphate, and other water impurities are consumed by the macro-algae through photosynthesis and will remove toxic water for the inhabitants in the display tank and give off oxygen that will be beneficial for the inhabitants in your aquarium. A refugium can also be used as an area to grow live food sourcesTurn this sump section into an ideal place for Copepods and amphipods to live and reproduce so that you will have a regular supply of food for your fish, corals, and invertebrates. 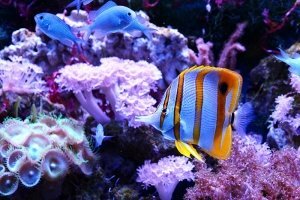 It is vital to keep all of your marine fish tank equipment in good working order; this is why a water top-up system in the sump is important. Many marine maintenance products must be kept sitting in a certain water level in order to run efficiently. Having a water top-up system will save you a lot of time and keep the balance of your water constant. This control system will replace water lost from evaporation. When water evaporates from a saltwater fish tank, only fresh water evaporates and salt is left behind. It is very important to top up with the purest water you can, RO is best. An auto top up system has a sensor that detects the water level in the sump's return chamber so when it detects the water level has dropped, it supplements the loss with the RO water from the top up water tank. This will keep the salinity stable and save you from having to top-up manually every day. Size is the main factor to consider when choosing a sump tank. As one of the main purposes for a sump is to keep water from overflowing onto the floor, it needs to be big enough for your main fish tank to do so. A good rule to follow would be that your sump should be able to hold all of the water that would drain out of your equipment (plumbing, pipes, etc.) in case of any loss of power. If you are setting up a brand new fish tank with a sump, there is a way that you can measure how much water will drain and the level at which water in the sump should be kept at. You will need to have your tank filled and get all of your equipment running. Turn off the power to your fish tank and let the water from the equipment drain into the sump – you can now see how much water would drain out. While the power to the aquarium is still off, fill the sump near to the top. You can now turn the power back on. You will see that the water level in the sump tank will start to go down as water is being pumped back into all of your equipment. The water level in the sump at this point will be the highest it can be without risk of overflowing if there were to be any power failure. As far as tank material, there are plenty of options available; acrylic or glass sump tanks are a great choice because it is safe for marine life and is extremely durable. We know that setting up a sump and understanding all the mechanics behind these tanks can be quite complicated. There is so much information to squeeze into one little blog article, so if you are still feeling stumped about sumps, contact our team of experts on our support centre. Where Can I buy Marine Salt?